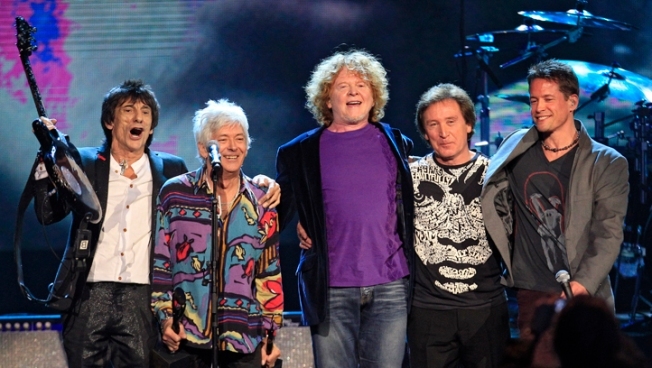 Small Faces/Faces members Ron Wood, left, Ian McLagan, second from left, and Kenney Jones, right, stand with Simply Red lead singer Mick Hucknall, second from right and bassist Conrad Korsch after performing at the Rock and Roll Hall of Fame induction ceremonies. The Rock and Roll Hall of Fame ceremony didn't miss Axl Rose at all. The rowdy celebration, which in past years has included awkward moments, touching tributes and unforgettable performances, rocked on without Rose, the Guns N' Roses frontman who may one day regret skipping a night when 6,000 fans, 1,400 guests and many of music's biggest stars partied in Public Hall with the class of 2012. Hard rockers Guns N' Roses — minus Rose — headlined this year's eclectic group of inductees. Others being enshrined are the Red Hot Chili Peppers, the Beastie Boys, folk icon Donovan, late singer-songwriter Laura Nyro and British bands the Small Faces and Faces. Before the ceremony started with a blistering performance by Green Day, Chili Peppers lead singer Anthony Kiedis said it was strange to be enshrined while on tour. As Rose was somewhere else, Cleveland rocked without him. Green Day, which was scheduled to induct Guns N' Roses, got things started by tearing into "Letterbomb" with Billie Joe Armstrong leading the sold-out room of fans and celebrities in an "Ayy-ooh" chorus. The first mention of Rose's name drew a smattering of boos that were soon drowned out by the music. Rose, the screeching frontman and ringmaster of the G N' R traveling circus of dysfunction for decades, said earlier this week that he didn't want to be part of the ceremony because it "doesn't appear to be somewhere I'm actually wanted or respected." He cited a continuing rift with his former band mates as the main reason for not attending. His decision disappointed fans and ended months of speculation about whether the original Guns N' Roses lineup would unite for the first time since 1993 and perform any of their classic hits like "Welcome to the Jungle" or "Sweet Child O' Mine." As the ceremony approached, fans gathered on the sidewalks outside the historic venue, which hosted the Beatles in 1964, for a peek at some of rock's royalty. Alice Cooper was the fan favorite on the red carpet, signing autographs, telling printable stories and waving in response to cheers of "Alice, Alice!" "New York is glitz, Cleveland is the nuts and bolts," said Cooper, comparing the cities that share the rock hall induction ceremonies, which are held at New York's Waldorf-Astoria and come to Cleveland every third year. Cooper, standing under a canvass canopy protecting against threatening skies, marveled at the scene and said he was glad to be around. "It's our version of the Academy awards," he said. "If you can stay alive to 27 — that seems to be the expiration date for rock stars." Funk icon George Clinton made a splashy entrance, arriving in a silver bullet-shaped vehicle familiar to amusement park thrill riders. Wearing a gray herringbone coat and black fedora, he stood and waved from the back seat. Rose isn't the only lead singer missing. Rod Stewart, who was to be inducted and perform with Faces, came down with the flu this week. Faces will be joined for a short set of songs by Simply Red's lead singer Mick Hucknall, a friend of the band. Like Guns N' Roses, the Red Hot Chili Peppers emerged from Los Angeles during the 1980s when Sunset Strip's rock scene was dominated by "hair" bands more concerned with their tight lycra pants and eyeliner than their sound. Not the Chili Peppers, who found their unique groove by blending funky hooks and a punk ethos. Three white middle-class smart alecks from New York, the Beastie Boys were initially dismissed as beer-swilling frat boys following their 1986 debut album "License To Ill," which featured songs like "(You Gotta) Fight For Your Right (To Party!)" and "Girls." But their follow-up, "Paul's Boutique," was acclaimed by critics and brought the Beasties credibility in the black hip-hop community. Mellencamp, sporting a healthy growth of gray whiskers, grabbed a few puffs on a cigarette as a video tribute of Donovan played on giant screens. During his remarks, Mellencamp raised the copy of Donovan's "Fairy Tale" album he bought 47 years ago as a kid in Indiana. Instead of reading prepared notes, Donovan accepted his honor by reciting a poem inspired by his induction. It ended with the line: "I thank my fellow artists all." Blues guitarist Freddie King was the first to be inducted as an early influence. Nicknamed "The Texas Cannonball," the late King was one of the first bluesmen to be backed by a multi-racial band. He was welcomed into the hall by ZZ Top's Billy Gibbons and Dusty Hill. "Freddie taught us how to play like a group," Gibbons said. King's daughter, Wanda, accepted on her father's behalf. "We Texans are going to show you how to lay down the blues," she said before ZZ Top was joined by Derek Trucks and Joe Bonnamassa in ripping through King's "Hideaway" and "Goin' Down." The influential Nyro, who died in 1997, had hits songs for other artists. She was inducted by singer Bette Midler, who called the New York songstress "one of my favorite artists. I loved her the moment I dropped the needle on the vinyl. She influenced so many musicians. She was the very essence of New York City. She cast a long shadow on my generation."